Every customer who purchases a new or pre-owned vehicle from Champion Advantage is given a unique and comprehensive benefits package consisting of THOUSANDS OF DOLLARS OF SAVINGS that no other dealership offers their customers. These benefits are provided to you for FREE. Fresh Start Program – FREE Oil & Filter Changes, FREE Car Washes, FREE Merchandise and DISCOUNTS on General Vehicle Maintenance and Service & Parts. All worth up to $1,000 in savings. Plus FREE Collision Deductible Reimbursement Policy worth up to $500 per Insurance Claim for 3 Years (Not valid with State Farm Insurance). 10 Minute Quick Quote – within minutes of selecting your vehicle, you will be presented with your Best Price, Payment & Down Payment Options. GUARANTEED. Discounts to active and retired Military personnel and Seniors. Bird Dog Program – earn cash rewards for every new customer you send us who purchases a new or pre-owned vehicle from Champion Advantage. Earn up to $3,000 a year. State-of-the-Art Facility with modern amenities including FREE Wi-Fi, Satellite TV and Refreshments. See dealer for complete details on all benefits/programs listed above. 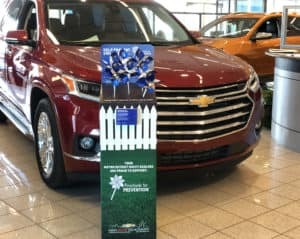 Prior to sale, customer must present a current advertisement for that month or written offer from competing dealership within the state of Michigan. The advertisement or written offer must show a lesser final sales price on the exact same year and model new vehicle including color, options, accessories and any applicable trade values. If exchange vehicle is of greater value, then the customer must pay the difference. The returned vehicle must be in the same condition it was in when purchased. Limit one time only. No cash value. Together We Can Turn Things Around. 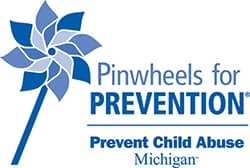 Champion Chevrolet of Howell, Matthews-Hargreaves Chevrolet, Champion Chevrolet of Fowlerville and your Metro Detroit Chevy Dealers are proud to support Pinwheels for Prevention, a campaign designed to create awareness for the prevention of child abuse in Metro Detroit. Sadly, in Southeast Michigan alone, 1 in 10 kids are sexually abused by the age of 18. 87,811 children are currently in families being investigated for child abuse and 15,000 children are in the foster care system. April is National Child Abuse Prevention month and our Chevrolet dealerships want to help spread the word. Visit one of our Chevrolet Dealerships in Howell, Royal Oak or Fowlerville, now through April 30th, and pick up a free pinwheel from our pinwheel garden.The pinwheel is the national symbol for child abuse prevention and represents a carefree childhood. By taking one and displaying it, you’ll be showing your support. Plant your own pinwheel garden at your business, school or home. Donate money to your local Child Abuse Prevention agencies. Spread the word online through your social media pages. Lastly, if you suspect abuse or neglect, call 855-444-3911, any time day or night. This toll-free phone number allows you to report abuse or neglect of any child or adult. Visit https://www.michigan.gov/mdhhs to learn the signs of child abuse. Remember, it only takes one person to impact the safety of a child. Champion Auto Group	42.7402952, -84.645271.